Two Bafana Bafana internationals will lock horns in the Coupe de la Ligue final in France tonight, with the duo having both been named in their respective side’s squads for the game. 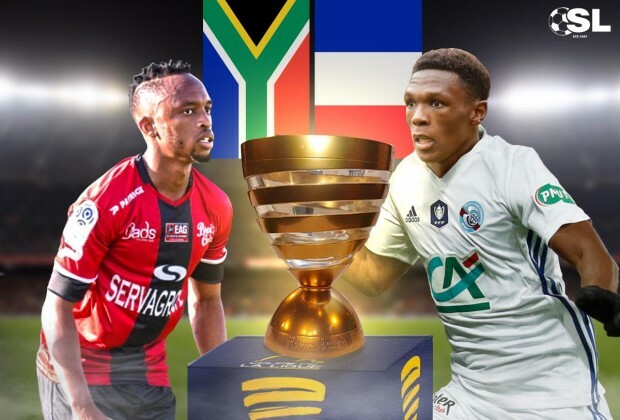 Lebo Phiri’s EA Guingamp will take on Lebo Mothiba’s Strasbourg in at the Stade Pierre-Mauroy this evening, with one of them guaranteed to lift the trophy come the end of the clash in Lille. Both players have played a key role in helping their respective team reach the grand finale of the competition, with Phiri playing every game and scoring a decisive penalty in the semifinal, and Mothiba scoring two vital goals in the same round. Now, with both Guingamp and Strasbourg having named their squads, it is looking likely that both players will be on the field together at some point this evening as they look to pick up their first European trophy in their young careers. Read: Spotted – A New Signing For Absa Premiership Title Race? Despite being just 24 and 23 respectively, the duo have already spent many years plying their trade in Europe as they moved up the ranks, with Phiri making his name at Brondby in Denmark before moving to Ligue 1, and Mothiba doing his thing for Lille and Valenciennes prior to his transfer to Strasbourg. While the two have become close friends off the field over the years, that friendship will be put to one side for one night only as they battle it out for the Coupe de la Ligue trophy. Ooh I remember 1's Bennie and Quinton Fortune did play against in CL KO of 2004 where the score was 2-1 to Porto with only them on the scoresheet, OOh what a proud moment 2 b South African...! !